Could I have wrist pain from a wrist fracture or broken wrist? It can be a scary to think that your wrist pain could be from a wrist fracture or broken wrist. There are different treatment options that depend on your activity level, your work, and the type of fracture. Multiple types of fractures can occur in the wrist. Some of the more common fractures are discussed below. The most commonly broken wrist bone with a fall is the distal radius or the end of the radius. The radius is the larger of the two forearm bones at the wrist. Symptoms of a distal radius fracture are immediate pain, bruising, swelling, and tenderness. Often times the wrist hangs in an odd or bent way, otherwise known as a deformity. What are the risk factors for a distal radius fracture? Osteoporosis is a risk factor for all types of fractures, especially a distal radius fracture. A broken wrist can happen in healthy bones as well. The majority of these types of fractures occur in people older than 60 years of age who fall from a standing position. The other subset of people who injure their wrist are young patients with a high impact fall, causing a break in an otherwise normal wrist. How is a distal radius fracture treated without surgery? Treatment for a distal radius fracture involves the nature of the fracture, the age and activity level of the person injured, and the orthopedic specialist’s personal preferences. The doctor can cast the broken bone if it is in good position and is stable. Sometimes the orthopedic specialist must straighten the bone (reduce or set it) before a cast is applied. This is what doctors call a closed reduction. The cast is usually worn for about 6 weeks and at that time the doctor could order physical therapy to help with rehabilitation. What is involved in surgical treatment? There are times when distal radius fractures result in the bone being so much out of place that it cannot be corrected without surgery. The orthopedic surgeon will make an incision to directly access the broken bones to improve alignment. Hand surgery specialists like Drs. Vahey and Gluck have specific training in complex wrist fractures. The bone can be held in correct position with the use of a plate and screws, metal pins, an external fixator or any combination of techniques. While surgery does have certain risks, often times patients will regain function in less time if the orthopedic implants are stable enough to allow for early range of motion. This is the main benefit of surgical treatment. The scaphoid bone is one of the small bones in the wrist, also called carpal bones. 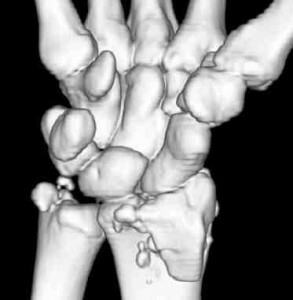 It is the carpal bone that is most likely to break. It is located on the thumb side of the wrist in the area where the wrist bends. It can be easily located when the thumb is held in a “hitch-hiking” position. The scaphoid bone is at the base of the hollow made by the thumb tendons call the “snuff box”. Symptoms of a fracture include pain, swelling, and tenderness at the base of the thumb. The pain will worsen when the person grips something or tries to move the thumb or wrist. A scaphoid fracture is usually caused by a fall onto an outstretched hand and is not always as painful as one might think. What are the risk factors for a scaphoid fracture? 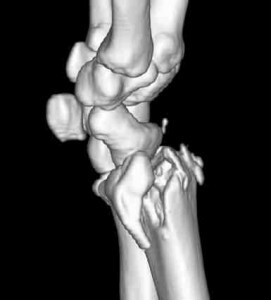 Anyone can fracture their scaphoid bone but it is more common in athletes who participate in activities where falls are common. Men aged 20 to 30 are most likely to experience this type of injury. How is a scaphoid fracture treated without surgery? If the bone is in proper position and has good blood supply, the orthopedic specialist may treat it by casting. The cast is usually worn for 12 weeks. Many opt for surgical stabilization to minimize the length of immobility. Due to the precarious nature of the blood supply to the scaphoid, the orthopedic specialist may recommend surgery to optimize healing and prevent long term wrist arthritis. During the procedure metal implants (such as screws and wires) are used to hold the scaphoid in place until the bone is completely healed. The surgeon makes an incision over the front or the back of the wrist to align the bone, insert the metal implants, and repair the damage. In special situations where the bone is not healing well on its own, a bone graft may be needed to aid in healing. A bone graft is new bone that is placed around the broken bone to help stimulate bone healing. This allows the bone pieces to heal together into a solid bone. At the Hand Center of Nevada, Drs. Gluck and Vahey specialize in the treatment of wrist fractures and use multiple techniques, including advanced arthroscopic-assisted fracture fixation techniques. This, coupled with on-site physical or occupational therapy, helps to ensure that patients have the best possible outcome. X-rays can be obtained in the office. Fractures can also be set with local anesthesia and cast in the office, so a trip to the emergency room is not always necessary. Consultation for surgical treatment can also be performed. Notify the office of your injury at 702-798-8585, and to make your appointment. Patients can often be seen within 24 hours, or even the same day, during the week. Walk-ins are also accepted. The office is at 8585 S. Eastern Ave in Las Vegas, close to the 215 and Henderson. Our doctors can even be reached on the weekend using the office number to help arrange for treatment.